To stamp out ISIS, Baghdad and Washington will have to change fundamental assumptions driving their strategy. On December 28, 2015 the Iraqi government announced the liberation of Ramadi, capital of Anbar, Iraq's largest province, from the so-called Islamic State (ISIS). With cautious optimism, many international media outlets heralded the event as the beginning of the end of the ISIS reign in Iraq. In fact, the retaking of Ramadi was merely a tactical victory with significant firepower after a long-drawn-out military campaign. In order to achieve a strategic victory against IS, both Baghdad and Washington will have to change fundamental assumptions driving their anti-ISIS strategy. Many comparisons have been drawn to the Anbar awakening in 2006-07, when tribal fighters and former insurgents banded against al-Qaeda in Iraq (AQI) with American support. The conventional wisdom is that U.S. tactics were largely responsible for gaining the trust of local Sunnis, thus enabling Washington to partner with them in the counterinsurgency fight. A surge of U.S. combat troops secured urban areas, then, one-time enemies became trusted, and locals provided necessary intelligence to root out terrorists and rebuild the local forces with more oversight. The retaking of Ramadi was merely a tactical victory against ISIS. Taking their cue from this analysis, senior leaders in Baghdad believe the Iraqi Security Forces can lead operations into Ramadi, hold strategic locations, and build the requisite trust needed to gain control over local security forces. In Baghdad's view, if Washington succeeded in doing this without a deep understanding of local knowledge and customs, Iraqis should be able to do so on their own. The logic follows that if Baghdad is the patron of a new Anbar awakening, any future security arrangement between Shiite-led Baghdad and Sunni provinces will have greater longevity. In actuality, the decisive factor in the success of the Anbar awakening was that AQI was seen by most Sunnis, especially other Islamists within the insurgency, as a greater enemy than the U.S. forces. Moreover, the Shiite-led government in Baghdad, which Sunnis saw as a pawn of Tehran, was an enemy as well. In these circumstances, Washington became the lesser of three evils and the most willing to compromise. Since U.S. forces held significant sway over the formation of the Iraqi Security Forces and Iraqi government policies, Sunnis assumed that joining the security forces to defeat AQI and partnering with Washington would give them more power over Baghdad's policies in Sunni areas. In the end, Sunnis decided to take the lead in ridding their province of AQI. The 2006 Anbar awakening succeeded because AQI was seen by most Sunnis as a greater enemy than U.S. forces. Now with the U.S. forces out of Iraq, the ball is exclusively in the Iraqi government's court. The Shiite-led government has thus far failed in Anbar in part because it is still seen as a sectarian government taking orders from Iran. Adding to this is the fact that Baghdad has had more urgent priorities, mutual distrust between it and the Sunnis, and a general lack of Sunni unity. Declining oil prices and more urgent threats in northern Iraq have meant that priority for Baghdad's scarce resources has been given to Shiite and Kurdish constituencies (while Anbar is Iraq's largest province, its Sunni constituency has little sway in Baghdad). Additionally, mutual distrust between forces connected to former prime minister Nori al-Maliki and Anbari police during legitimate protests in 2013 and 2014 has led Baghdad to rely on outside security forces for local law enforcement. Lastly, disunity among Sunnis stemming from disagreements over the 2013-14 protests continues to keep them from creating a united front. This disunity reinforces the Baghdad government's distrust of Sunni fighters and the attendant preference to supply better-organized and more-motivated Kurdish and Shiite fighters in the northern provinces. Baghdad must make concessions on Sunni political and security demands. Nonetheless, Baghdad still has an opportunity to play a significant role shaping the outcome in Anbar, much as Washington did in 2006-07. If Baghdad is interested in generating a new Sunni uprising against IS, it will first need to address the same fundamental factors, agree to compromise, and find a commonality of interests. The government can do this by passing the Iraqi National Guard law to formalize the role of local Sunni tribal militias and former military officers in the fight against ISIS, a step that would indicate to the Sunnis that Baghdad is serious about giving more powers to Sunni provinces to oversee their own security. The government can also make concessions on Sunni political demands—more jurisdictional autonomy, equal application of de-Baathification laws, release of prisoners—and devote more money to salaries, weapons, and supplies for those local fighters fighting ISIS who have been demoralized by Baghdad's distrust. Without addressing these fundamental needs, Baghdad will continue to be seen by many Sunni stakeholders as an enemy, and it will not be able to unite them against IS. 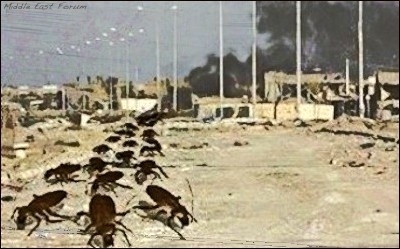 Its fight against ISIS will continue to be akin to killing cockroaches without addressing the source of their infestation. Jensen is an assistant professor at the United Arab Emirates' National Defense College. He served in Iraq's Anbar province as a contract linguist for the U.S. Army and as a civilian foreign area officer for the U.S. Marines. He wrote on this topic recently for Middle East Quarterly, a publication of the Middle East Forum.